LBN 438 is a part of the much larger molecular complex, known as Lacerta 10 (or Lac 10) and including Sh2-126, LBN 437 and others. The densest part of LBN 437 is associated with some bright young stars, among which is the variable star V375 Lacertae (or LkHα 233), - a young Ae / Be Herbig star which shows strong Hα-emission. The whole region is part of Lacerta OB1, a huge region of star formation, which is about 1200 light years away from Earth. 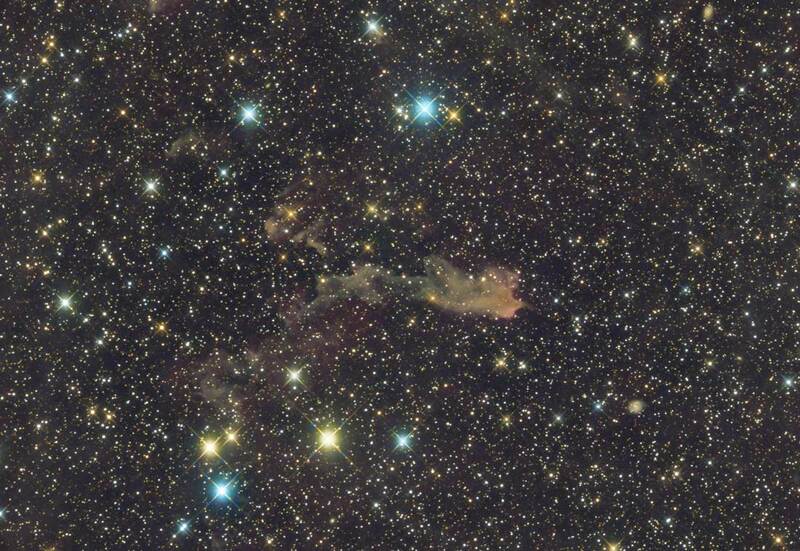 The reddish background is due to the strong emission of Sh2-126 in the red part of the spectrum.